After a night full of Vegas's best nightclubs, strip clubs, and 99-cent margaritas, you could probably use... another night full of nightclubs, strip clubs, and 99-cent margaritas. 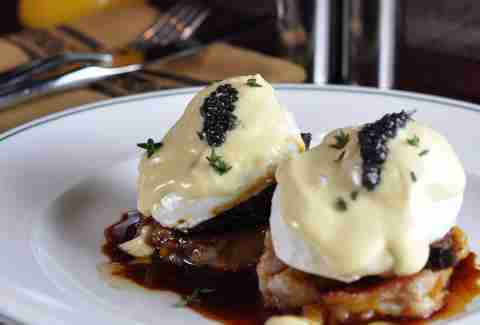 But first you'd better find time to eat one of Sin City's 13 best hangover breakfasts. Don’t sit around in pajamas munching on cereal and watching Saturday morning cartoons. 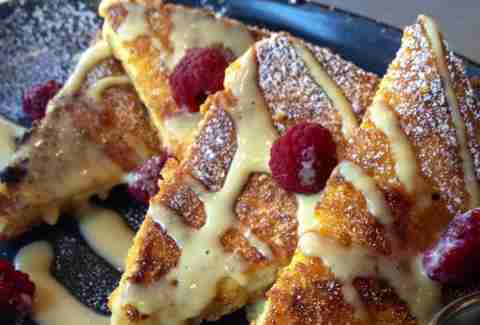 Be a man and head to the Hard Rock Hotel & Casino where you can order the Cap’n Crunch Crusted French Toast. It comes with a custard batter made from cereal milk, fresh raspberries, and an oddly placed apostrophe. After a late night at Marquee, you don’t have to leave the building to grab breakfast. On the ground floor of the Cosmopolitan, you’ll find The Henry and its Signature Short Rib Benedict -- made with poached eggs, braised short ribs, hollandaise, and crispy potato cakes. 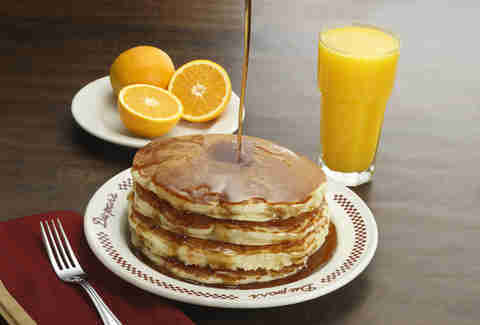 This vintage diner inside the Golden Gate Casino serves a sky-high stack of golden pancakes that are perfect for soaking up a hangover. Esquire called them the “best pancakes in America” and you can get ‘em 24 hours a day, or in other words, whatever time you happen to wake up. On the weekends, you can check out the restaurant’s Bloody Mary cart as early as 9:30 in the morning. The All About Mary comes with bacon vodka and an excessive amount of garnish -- including a bacon cheeseburger slider, a chicken wing, shrimp, and a mini corn dog. Why order food at all when you can have most of the appetizer menu on your drink? After a night of sloppy behavior, you’ll need to find a sloppy breakfast. 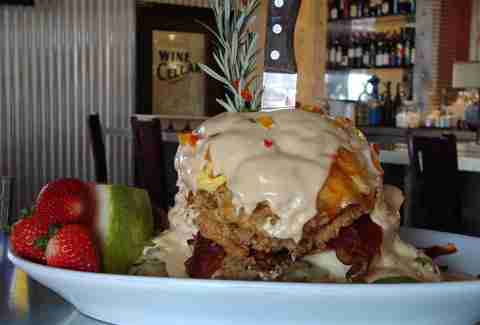 Andy’s Sage Fried Chicken Benedict is a scrambled egg combo that’s served on two split biscuits and griddled mashed potatoes. Pair it with some O’Hare of the Dog… a 24oz Budweiser in a paper bag with a side of bacon. You need caffeine. Badly. Sambalatte’s new location in the Monte Carlo courtyard not only roasts its own coffee beans in-house, it also has the only Steampunk brewing machine in Las Vegas. 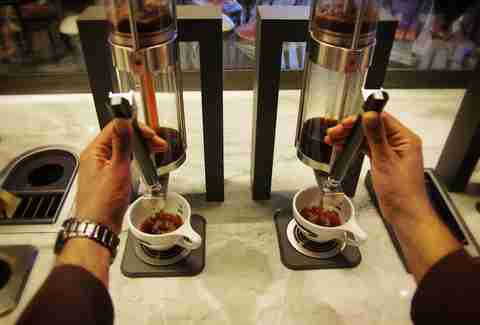 Think of it as a computerized French press that makes a perfectly consistent cup of java. Chances are good that you blew your money on bottle service at the club and need something cheap and greasy for breakfast. 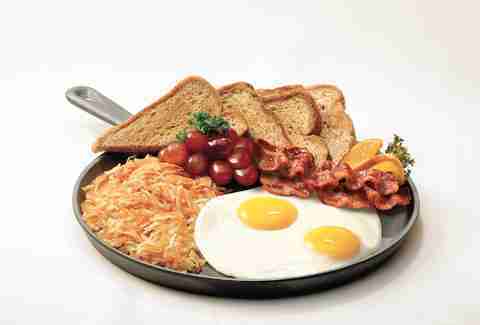 The Grand Café inside the Red Rock Resort has an all-nighter menu with two eggs, bacon, toast, and hash browns for just $3.99. Don’t forget to tip! 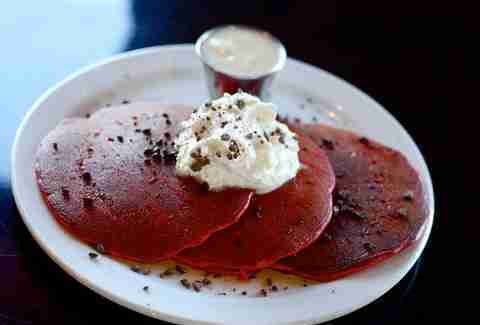 This place is famous for its Red Velvet Pancakes. 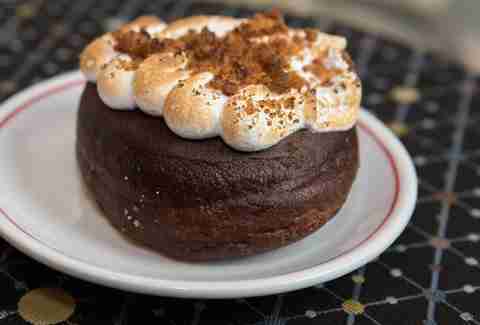 They’re topped with fresh whipped cream, chocolate crumbles, and a cream cheese syrup. Who needs dessert when you have a stack like this to satisfy your sweet tooth? 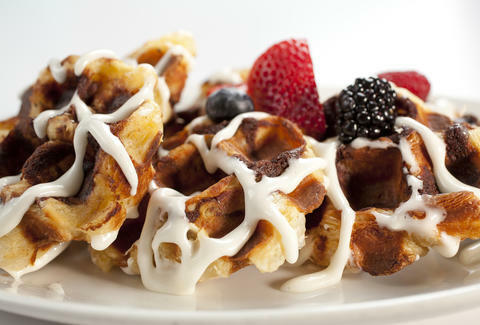 Wander through the lobby of the Downtown Grand and get your hands on adventurous dishes like the Cinnamon Roll Waffles and the smoked salmon plate. But it’s the antioxidants from the freshly squeezed fruit juice -- including orange, grapefruit, watermelon, and cucumber -- that will cure your hangover blues. Sometimes all you need is a quick cup of coffee... and weirdly delicious doughnuts to soften a hangover. Flavors include s’mores, Mexican chocolate, bacon apple fritter, and vegan apple pie. 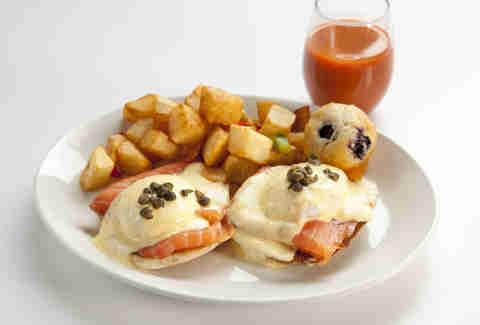 There’s even one with made-to-order lox to keep all your breakfast options covered. 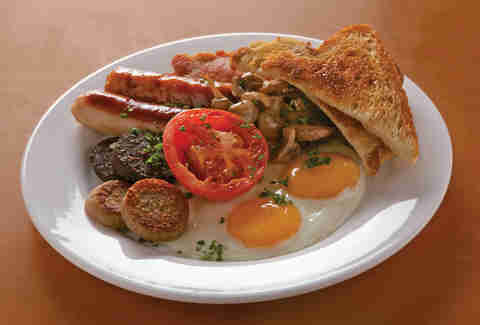 The Irish Breakfast comes with eggs, Irish sausages, rashers, B&W pudding, tomato, mushrooms, and toast. Perfect for those who drank too many pints of Guinness the night before. Too hungover to use silverware? Get your hands on the Bacon Dippers. 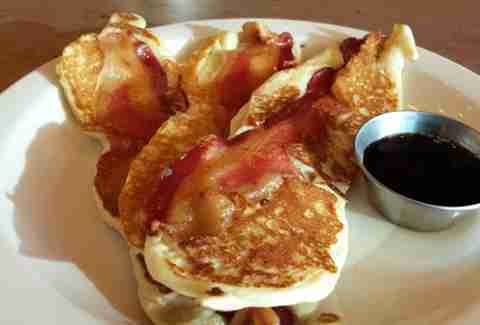 They come with bacon cooked inside some long pancakes and a side dish of peppercorn maple syrup, like a gourmet version of a McGriddle. 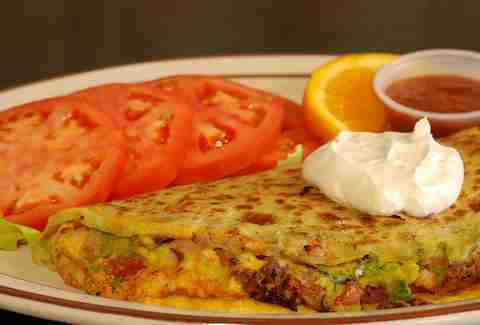 The Key Largo Crepe is available at The Egg and I and other Egg Works locations around the Valley. It comes with smoked turkey, bacon, guacamole, tomatoes & cheese, is topped with sour cream, and comes with a side of salsa. 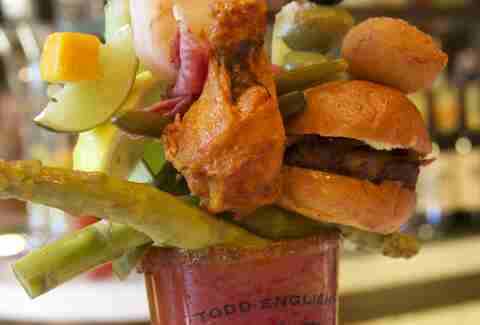 But you’ll really want to top it off with the Habla Diablo Bloody Mary -- to give your hangover recovery a spicy kick.